JP Needlepoint Cars From the 60s. 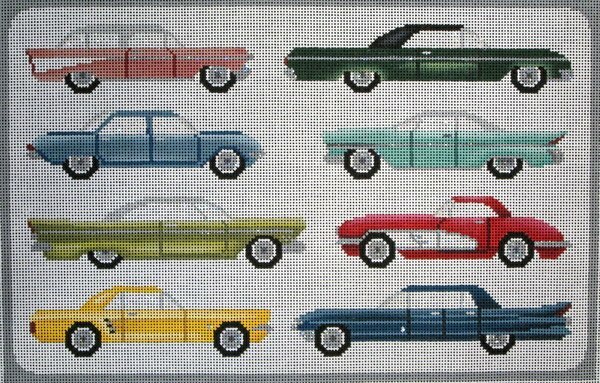 Handpainted Needlepoint Designs > Vintage and Retro Needlepoint > JP Needlepoint Cars From the 60s. This retro needlepoint design is skillfully handpainted onto 13 mesh mono Zweigart needlepoint canvas. The design area measures 15.25" x 9.75". You can purchase this design canvas-only or with fibers. If you select cotton we will send DMC embroidery floss; if you select wool or silk we will send Planet Earth boutique fibers specially formulated for 13 mesh canvas. If you wish to purchase stretcher bars we recommend a pair of 19" and a pair of 14" stretcher bars.